Watching Donald Duck cartoons from this era of Disney quickly becomes an exercise in looking at how the animators are working to make the main duck more interesting. We’ve seen new adversaries added, like Chip and Dale and different animal antagonists, and that trend continues with Hook, Lion and Sinker. In this case, it’s a mountain lion and his son, trying to abscond with…yes, Donald’s food. 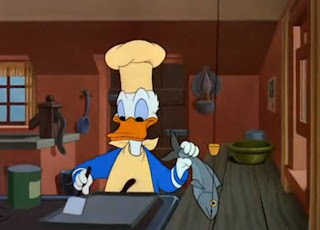 It comes to a certain point where you wonder if the Disney animators got enough to eat. 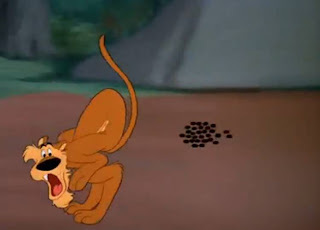 We saw yesterday that Chip and Dale’s short with Pluto was focused on stealing food, as most of their shorts are, and in Hook, Lion and Sinker the mountain lion is laser focused on taking fish from Donald’s cabin. 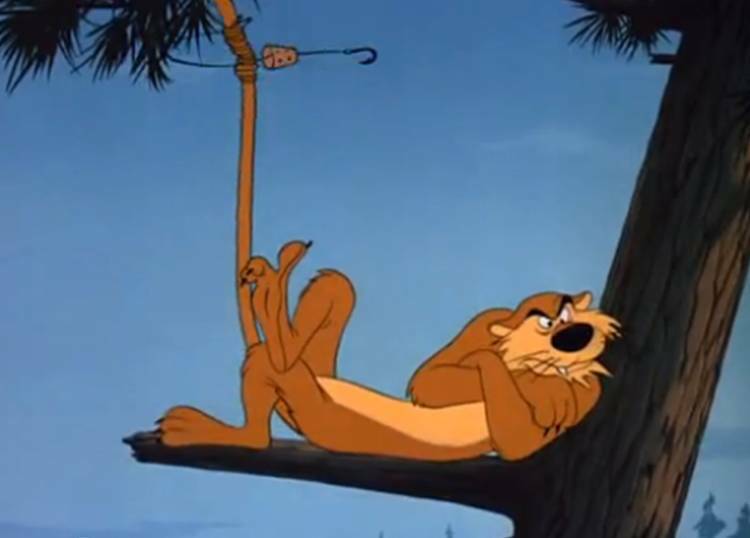 The gags all focus on a pile of fish that Donald presumably caught in the lake nearby, which the young mountain lion sees as his older cohort is focused on fishing instead. Once the giant fish show up, the mountain lions try to find ways to infiltrate Donald’s cabin to retrieve them. The problem is, in this short Donald is a fine outdoorsman, with heads of several feisty mountain lions mounted on his wall. This is not something we’ve seen from Donald’s character before. Sure, he’s a fiery tempered duck, but a crack marksman who manages to chase and destroy his adversaries? Sounds more like the Punisher than Donald Duck. It’s for that reason that the rest of the short doesn’t exactly ring true. The lions are bumbling fools, at least the way they are portrayed, and Donald is pushed as the heavyweight who outsmarts them. Again, this doesn’t ring true with what we’ve seen of him in other shorts. The lions are not something we’ve dealt with before, but using them in this way does not make them compelling characters. Look at Chip and Dale. They are not menacing, but they are portrayed as silly, yet ultimately effective characters. It’s a polar opposite approach to Hook, Lion and Sinker. 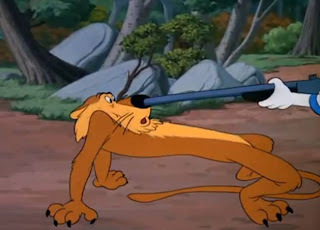 There are certainly good gags in the short, such as the buckshot constantly being picked out of the lion’s behind and chasing the lions through the forest. The problem is that the viewer can’t connect to the lions, because their intent is ultimately evil, and it’s taking away from Donald. He hardly appears in this short, which means that the lions need to be the compelling characters. It’s an inversion of the typical Disney formula that might work as an experiment, but ultimately fails to entertain.